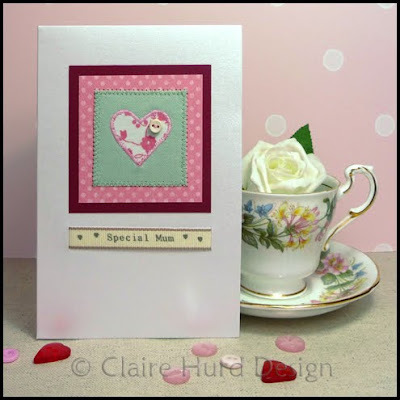 I have just added a new Mother's Day card design to my online shops (both Folksy and NOTHS). 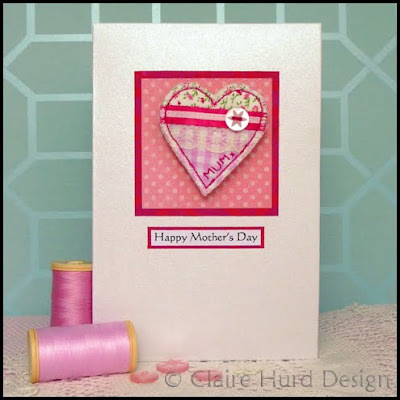 This elegant handmade Mother's Day card has a detachable fabric heart brooch. The brooch has been lovingly handmade and embellished with lace, satin ribbon, button detail and hand-embroidered 'Mum' text. The perfect card for Mother's day with a gift that can be treasured forever! The heart brooch measures approx. W.5cm, H.5cm. The card itself measures approx. W.10cm, H.15cm and comes cellophane wrapped with a matching pearly white envelope. 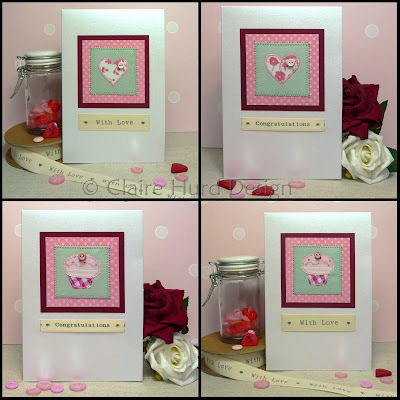 My Cupcake and Love Heart cards are now available with the options to have no text, an elegant 'With Love' ribbon threaded through the card face, or with a pretty 'Congratulations' ribbon threaded through. Take a look at my NOTHS Shop for details. Now that Valentine's Day has been and gone it is time to concentrate on Mother's Day (14th March). I discovered some lovely 'Special Mum' printed ribbon whilst out shopping for materials last week so I have added it to a couple of my card designs to create something especially for Mum. 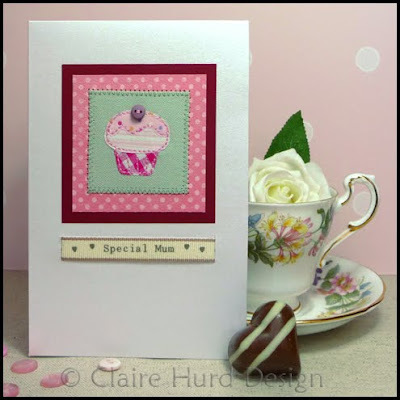 My 'Special Mum' appliquéd cupcake and heart cards are now available to purchase in my online shops (Folksy and NOTHS). I had been intending to frame this afternoon tea artwork from my portfolio archive for a long time. There were just a couple of details on the design that bugged me though and I kept putting it off. This weekend I finally got around to amending the details that bothered me and this artwork is finally mounted and framed. I did blog about this artwork previously after its first few tweaks in July 2008 but out of curiosity I looked up the details I had filed regarding this design (I keep dated patterns and templates for all of my artworks). 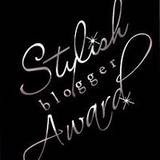 Would you believe I made this design in July 2007?! Certainly about time it was finally amended and framed! And surely a clear sign that I am not likely to tire of the theme of afternoon tea and cakes! I have a few more archive afternoon tea designs that could do with reinventing. I have had a few suggestions and requests from one of my stockists so lots to think about. I will keep you posted on what I come up with. 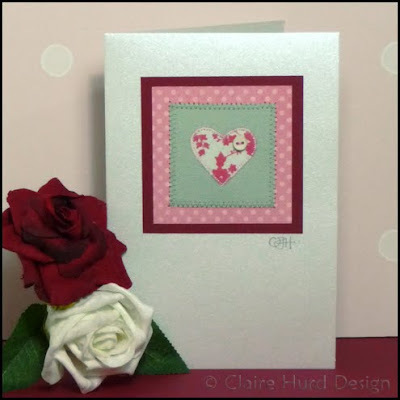 Due to the popularity of my appliquéd love heart card and limited availability of the materials used for this design I have run out! 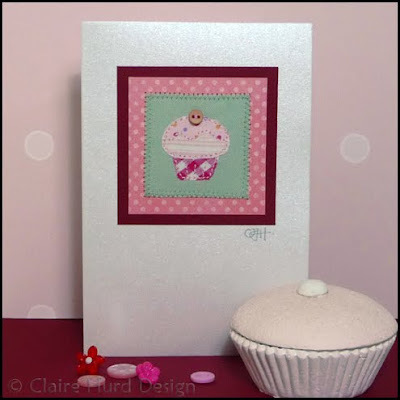 No panic though, I have taken the opportunity to update my love heart card and also re-introduce my cupcake cards. Cards are still available to order for Valentine's Day right up until midnight on Thursday 11th February. I shall also be making these cards available soon with ribbon messages reading 'With Love', 'Congratulations' and 'Happy Birthday'. Details will be featured here once they are available. The tea related products featured in my last post were created upon request by one of my stockists. I have had really positive feedback on them and have been given the opportunity to expand my range further and potentially begin creating some exclusive items for sale by this stockist alone. The potential for growth of my business is very exciting and I am really looking forward to creating more designs. 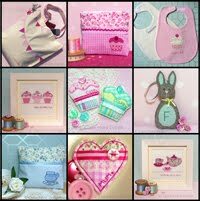 In celebration of all things 'tea' I thought I would do my first Folksy treasury today. There are so many gorgeous items for sale on Folksy produced by some really talented designers/makers it was difficult to narrow down my selection. However, here they are, my favourite handmade items found today by searching for 'Tea'. 1. I love this bright and cheerful tea cosy by Vintage Town. 2. This cute little pin badge by Nikkimade makes me think of my tea loving friend Ruth, I can see her wearing this one! 3. This glam necklace from MishaMakes would be a great gift for any tea-lover, I love the elegant text. 5. This cute little bracelet is from Fluffsstuffs. I love the quirky tea print fabric that has been used and the gingham ribbon detail. 6. This beautiful hand-stitched card is by Sew Lovely. The pretty design and delicate embroidery makes me think of traditional tearooms with tasty tea and chatter. 7. This hand-cut card is by Quite Contrary Crafts. I love the teapot shape and the care that has gone in to hand-making this design. 8. This wonderful teacosy is by Andrea Lesley Crochet. 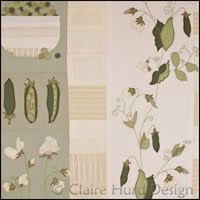 It comes from a great range of different floral designs and just shouts summertime and afternoon tea to me! 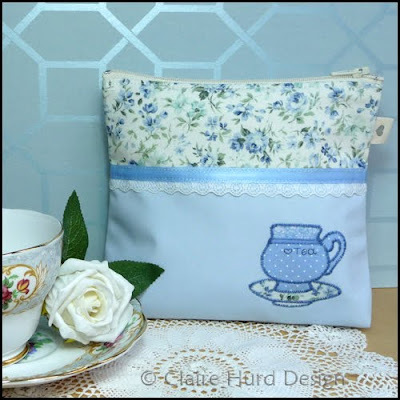 I hope you enjoyed sharing these great tea themed products with me. I have enjoyed creating my first treasury and hope to do another again soon. I think next time my theme may have to be cakes! 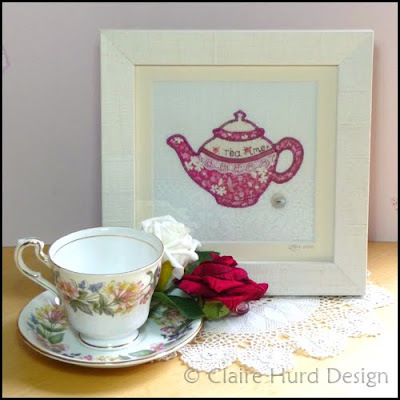 I have just added two new tea time themed goodies to my online shops (both Folksy and NOTHS). 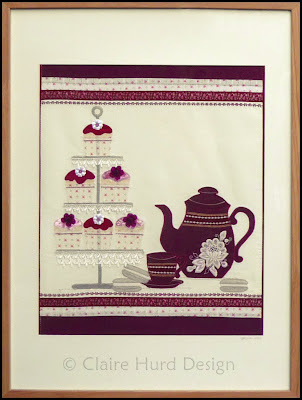 The first is a new embroidered and appliquéd framed teapot artwork. This artwork combines linen, lace and printed floral cotton and has lace trim, satin ribbon, a mother-of-pearl button and hand-embroidery detail. The second is a cute little make-up purse with an appliquéd teacup motif. This purse has been made in the same style as my make-up bags and thus has a sponge-clean acrylic coated linen/cotton fabric lining making it easy to keep it clean. If you would like to purchase one of these designs in another colourway or with a personalised message please email me at studio@clairehurd.co.uk.